Kheera ka raita is an Indian cucumber salad. This delicious salad will be served to nearby every dish in India. The combination of the fresh and creamy yogurt and the fresh cucumber makes many spicy dishes taste less spicy. 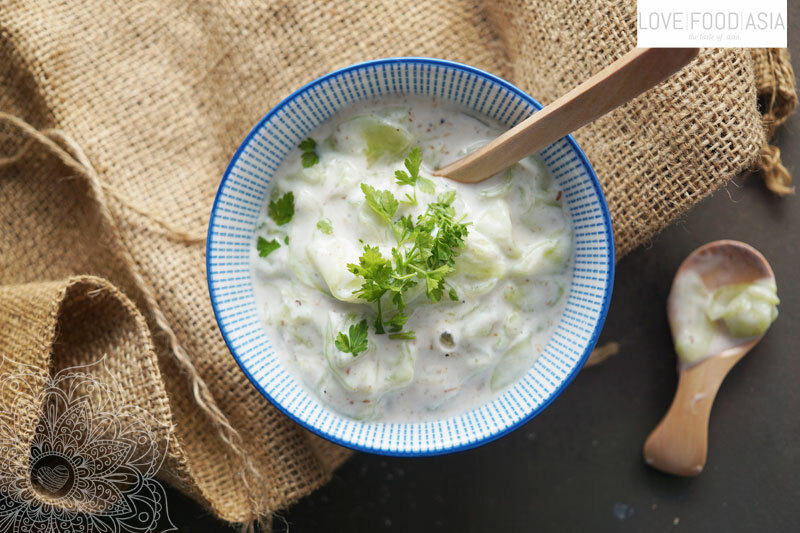 This Raita goes also very well with fresh fish and meat from the grill. It makes every summer BBQ even more exotic and special. Mix cucumber slices with 1 tbs salt. Set aside. Add yogurt to a cup. Use a fork to whip yogurt until creamy. Add ¼ tbs salt and sugar. In a small pan roast peppercorns and cumin seeds on medium heat for 40-50 seconds or until they start to smell. Let spices cool down and transfer to a mortar. Grind until you have a fine powder. Add powder to the yogurt. Save ¼ tsp of the spice powder. Lightly wash cucumber and squeeze. Mix with yogurt. Transfer to a cup and sprinkle with spice powder and capsicum powder.